The genius of Rova Saxophone Quartet resides somewhere between the carefully drawn musical maps of European art music and the wildest free-for-all joyrides of African American jazz. The territorial borders are constantly shifting, often within a single piece of music; at one moment the different elements are competing for the upper hand, at others they are inextricably bound in harmonious alliance. 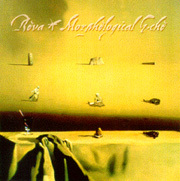 Rova's singular blend of composition and improvisation has been called "comprovisation," but that rather clumsy coinage only hints at the music's precarious internal balance, an equilibrium better reflected in the title of this extended work, Maintaining the Web Under Less Than Obvious Circumstances. 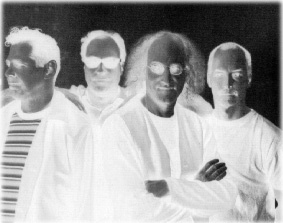 Perhaps the pinnacle of this quartet's gift for spontaneous composition, Maintaining the Web is a network of improvisations resulting from a series of musical "games" and "strategies" extemporaneously cued by the musicians during the actual process of creation. Although the signals and the rules are set, such crucial aspects as order and duration are determined on the spot. Thus the piece cannot be played the same way twice, and yet it always sounds like The Web. The notion of contriving a set of devices that provide direction during, rather than before, the actual playing, is one of Rova's solutions to the challenge of giving shape, form and content to a piece of music without being strapped with a predetermined language. It allows improvisers to communicate with each other through extramusical channels in the very course of performance, creating an authentic composition of the moment. The processes for Maintaining the Web evolved from a Rova collaborative project with the Margaret Jenkins Dance Company of San Francisco, during which the saxophone quartet discovered that mere hand signals were insufficient for indicating a wide enough variety of patterns and changes. Another collaboration, with musical gamesmanship pioneer John Zorn, gave rise to 20 discrete strategies that could be used in different orders and combinations. Although hardly crucial to enjoying the music, a detailed understanding of the specific devices sheds some light on the physical context in which The Web is woven. Take the "X Game," for example: Player A raises a flag and points it at another (thus designating player B) and starts the game by cuing an improvised sustained chord from the entire group. When the chord stops, player A plays a repeatable short phrase or "sound area:" player C cues player D to join him on a chord; when that chord ends, player B imitates player A's statement and player A moves on to a new one, played over B's rendition of the first idea. Upon another chord cue from players C and D, players A and B take off into a "free area." Yet another chord from C and D cues player B to assume player A's previous role of initiating a repeated idea, and the cue pattern is repeated with players A and B in reversed roles, and so on until the end. If the "X Game" has a certain cyclical symmetry, the "Hand Game" reveals the complicated options and permutations possible within The Web. The game begins when one player holds up a fan with a hand on it. The other three players then cut off or fade out (depending on how the Hand Fan is presented) and player A makes a short musical exclamation (or sometimes a longer, spacious line) that is not necessarily a repeating motif. Any of the remaining three players may now do one of two things: raise the Hand Fan and take the player A role, or raise two fingers to indicate that he is joining player A in a duo. In the latter circumstance, the other two players have three individual options: raise the Hand Fan and cut or fade players A & B; raise three fingers to say he is joining A and B in a trio; or raise two fingers to indicate that he will play in a duo with player B and that player A must drop out. If the Hand Fan is raised or if a new duo is formed, the options are as above, but if players A, B and C are engaged in a trio, player D now has four of his own choices: raise the Hand Fan (cutting or fading the others and becoming player A); raise four fingers (forming a quartet); raise two fingers (forming a duo with player C and putting players A and B out); raise three fingers (joining a trio with players B and C and forcing player A's exit). All of these possibilities can happen at any rate of change, and new players in duos, trios or quartets have the option to imitate, support, solo over or ignore any previously existing musical themes. The game ends when another one is cued. There are four flags (star, stripe, red dot, and yellow X) and seven fans (yellow-and-black checkerboard, dots, cactus, shoe, spider, saxophonist, and hand), as well as hats, balls and various other hand signals that are related to everything from speed and volume to the playing of harmonicas. Any of the four musicians can give a cue at any time and dramatically alter the course of the piece. It is his way of telling the others, "I've got it!" or "You take it!" Each player can choose to be a leader or a follower, seek the solo spotlight or hide in the shadows; he can nudge another out onto the highwire and then pull away the net; he can initiate a four-part juggling act with flaming torches and then toss in a razor-sharp machete. What is remarkable about "The Web," in the midst of all these unpredictable, often sudden maneuvers, is how well it is maintained. The overall musical coherence and the integrity of specific transitions are evidence that four sets of ears are always keenly attuned to how the parts fit into the whole. "Maintaining the Web" is a test of faith for the players, allowing for the free flowering of the individual spirit while requiring constant group empathy. Even while one musician is changing the direction, dynamic or vocabulary as he see fits, he has the responsibility of listening to the other players and responding to the demands of the ever-changing moment. The correlation between the physical cues and the actual music of "The Web" is less than obvious from the audio text alone. But you can easily follow the linear movement of each section through a labyrinth of left and right turns, handstands, cartwheels, tightrope walks, and vertical leaps between different levels of rhythm, melody, harmony and dynamics. What signals might have led into the wafting four-note theme of "Obvious," taken it into a frenetic Keystone Kops chase of melodic fragments and sirens, tempered it into a mournful blues, jarred it into jittery pointillism, or melded it into now brooding, now lighthearted spirals and swirls? How does Rova get from the beehive density in the middle of "Less Than Obvious" to the delicate chiffon layering only a minute or two later? What is the blueprint for the space created by the softly singing saxophone early in "Maintaining," and who mapped the path for the subsequent gentle padding down the hallway that leads into a claustrophobic roomful of excited molecules bouncing furiously against the walls? These kinds of questions may arise while listening to this recording but they are ultimately tangential to appreciating such elements as the unforced muscularity of "Circumstances" unfolding into sweet harmonizing worthy of a Billy Strayhorn ballad, or the complex tapestry of braying scales that threatens to burst apart at the seams during "The Web," but instead of unraveling, creates a multilayered weaving in which different threads snake to the foreground or retreat into the knotty matrix. In the end, all of the games and guidelines are only as good as the quartet's ability to put them to a higher use. The fundamental tenet of improvisation is that if it is going well, go with it. All rules and regulations are superseded by immediate circumstances; "right" and "wrong" are stripped of prior meaning; "mistakes" become new rules, perhaps to be overturned later. And both through and despite the elaborate repertoire of strategies, Rova is able not only to maintain the web but to recast it in a brilliant new form every time out. Originally commissioned by the San Francisco Jazz Festival to be performed in a "Sacred Space" concert in historic Grace Cathedral (on a program with Terry Riley), "Grace" offers another example of the way Rova resolves the alleged contradiction between composition and improvisation. Drawing inspiration from the physical space in which the piece was originally to be performed -- a resonant neo-Gothic cathedral that has hosted performances by Pharoah Sanders, Cecil Taylor, and others -- and from the musical ideas of Morton Feldman, "Grace" becomes a tour de force more of textures and timbres than of virtuosity. The live performance of "Grace" featured the individual Rova members moving about the hall so that sounds would literally emanate from various physical points at different moments in the concerts. The effect of sounds moving through space is echoed in the overall scheme of the work, which cycles through a notated section contributed by Steve Adams, and relatively short solo interjections -- Adams on alto, Ackley on soprano, and Ochs on tenor. The latter bridges into an extended group improvisation, yielding to Raskin's baritone solo and a final statement of the wistful, somewhat melancholy theme. According to Ochs, "Grace" is largely about the interrelationships of musical lines and the silence between the music. It was Ochs who brought a Morton Feldman recording to the group to help illustrate the musical procedures he envisioned the quartet using in Grace Cathedral. The process comes to full fruition during the ensemble improvisation. Each musician plays a simple motif and repeats it until he hears it relating to what the other three are doing, and then veers off in a slightly different direction until the group dovetails once again. In its subtle explorations of melodic line and timbre, executed with individual restraint and a splendid sensitivity to the group dynamic, "Grace" elegantly exemplifies Rova's masterful balance of the planned and the extemporaneous experience, and its uniquely refined (as well as emotionally complex) realization of spontaneous composition. More information about ROVA is available here.